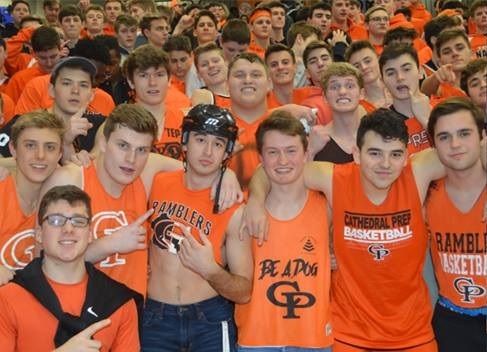 As the highly anticipated basketball game between the Ramblers and their crosstown rival McDowell came closer, the emotions started to rise. The goal was to get a rally in before the game, which was on Tuesday, Jan. 29. Assistant Vice-President of Academics and Student Affairs Mr. Herbstritt gave permission for the rally crew to have a rally on game day. With shortened classes and the huge game scheduled for later that night, many students were anxious for the rally. The rally started with music blaring in the auditorium, along with colorful spotlights running the walls. With the basketball team sitting in the front row, senior Michael Borowicz, a student favorite, led the school in prayer. Andrew Stark followed the prayer with the introductory welcomes. The introduction consisted of a wide variety of topics happening around Prep, ranging from Joey Scarabino’s commitment to Notre Dame College for football to Carter Starocci committing to Penn State University for wrestling. Next, the Rambler starting five was announced to come up on stage. Matt Berry followed with a Fr. Jabo chant, which brought some energy from the crowd. With the energetic students waiting for more hype, the look-alikes PowerPoint came up in the screen. The slideshow featured Chris Oliver, a Cathedral Prep Senior football player, and his look-alike who is a freshman. Shelby Wiley, a Prep senior football player, was featured as well, with his look alike being Childish Gambino. By the sounds of it, the look-alike slideshow was the most popular part of the rally according to the students. The “CP News Broadcast” was what came next. Chase Paglia and Ethan Taraski called up Michael “Stan” Kinecki and Joe Corsale, who are both on the basketball team. The news broadcast consisted of a question and answer dialogue between the four guys on stage. Dave Clark rushed out on stage following the broadcast, leading the students in a fun-filled roller coaster cheer. The students arms went flying as they were riding. The rally was cut short when Mr. Herbstritt saw students throwing pieces of auditorium chairs. In order to get a sense of how students judged the rally, a non-scientific informal poll was taken to see how much students liked the rally. Students were asked to rate the rally on a scale of 1-10, with 1 being the worst and 10 being unbeatable. With 26 students begin polled, the average student vote came out to be a 6/10.